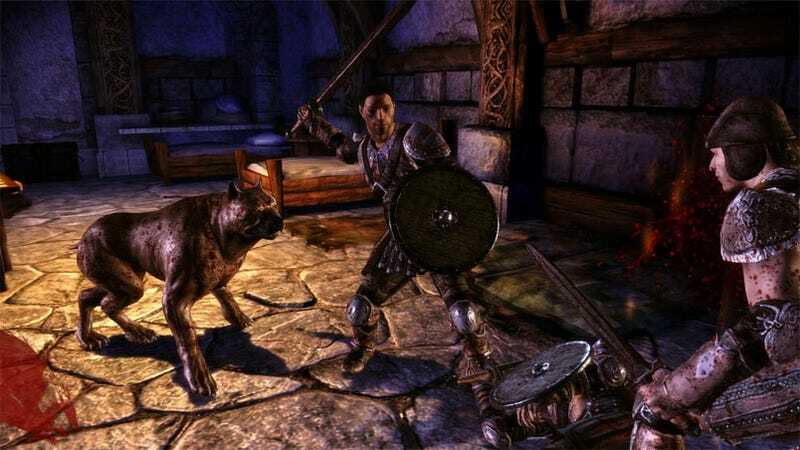 Dragon Age: Origins Xbox 360 Hands-On: Have You Considered The PC Version? BioWare brought the console version of Dragon Age: Origins to Comic-Con, our first opportunity to go hands-on with the game we'd seen in many hands-off demos and always on the PC. The experience was impressive, save for one negative. The Xbox 360 we sidled up to running a playable Dragon Age: Origins featured an already game underway. The previous player had already chosen his initial path, opting to play as a noble human warrior. That means we started out with a bit of social leverage and within a castle in the kingdom of Ferelden, one currently being invaded by enemy forces. Our initial fight was fought alongside one of the bulky Mabari War Dogs, a bruiser of a beast scarier than any pit bull. While the dog can be leveled up, the items available to our dog looked to be limited to collar types. We also joined up with our character's mother, who, against our dialog tree wishes, picked up a sword to fight alongside us as we made our way through the burning hallways of the castle. Our goal? To find our father, while searching rooms that turned up little more than enemy soldiers, the corpses of our compatriots and the occasional locked chest. Our demo concluded when we found our seriously wounded father, then engaged in a strategic meeting with some of the Grey Wardens, with whom we planned vengeance for the attack on the kingdom. Combat was relatively easy to get a grasp on, if a bit middling, with two skills—one, a dizzying shield bash, the other a stronger melee attack—making the action a little more than just target, attack and cool down. Those attacks were mapped to the X and Y buttons on the Xbox 360 controller, with a quick heal button mapped to B. Those skills and button mappings can be customized by pulling the left trigger and navigating a tiered circular menu. BioWare should be commended for its ability to get a complicated title like Dragon Age: Origins, with a rather complex menu system, to work with a standard controller. After a few minutes of fiddling, we quickly became accustomed to navigating Dragon Age's deep set of options. A color-coded inventory system and auto-leveling option makes exploring its depth that much easier, particularly for some of us who shy away from the more complex BioWare titles. Based on our hands-on time with the Xbox 360 version—and discussing the classes and races we didn't play with other members of the press—Dragon Age: Origins' story line looks to feature the depth and breadth that will ensure multiple playthroughs of the RPG. What didn't impress, were some of the visuals in the Xbox 360 version. Up close, Dragon Age: Origins can look extremely rough, particularly when interacting with non-player characters while traversing the game's dialog trees. Some of the presentation looked like a step back from BioWare's Mass Effect for the Xbox 360, with low quality textures and distracting geometry problems in character models. When the camera is pulled back, however, things look fine. Despite the lack of visual polish during portions of our Dragon Age: Origins demo, BioWare's spiritual successor to Baldur's Gate looks like an exciting epic adventure. After our hands-on time with the game, we'll definitely be looking at the PC version of Dragon Age, but looking forward to it nonetheless.